AU’s new Recreation and Wellness Center will feature a 50-foot rock wall, giant tiger paw shaped hot tub, largest indoor track in U.S.
Well, Well, Wellness Center: New student facility could be the best of its kind in the country. 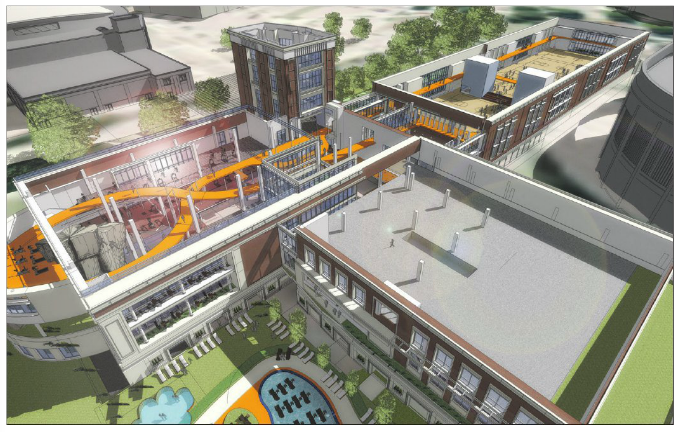 When it’s finished, Auburn should start letting couples reserve the new Student Recreation and Wellness Center for honeymoons or vacations or whatever like they let them reserve Samford Lawn for weddings and Auburn Arena for receptions. Because apparently it’s basically an amusement park. According to Adam Sardinha, Auburn’s Assistant Director of Marketing for Campus Recreation, that third of a mile indoor track will be the longest indoor track in the country. And we haven’t even talked about the five-story fitness tower. The whole thing should be open for business this spring. You can read more about it here. This is awesome and everything and I wish we had it when I was a student and the REC is a dump, but every week I read an article somewhere talking about rising tuition costs. I don’t blame just Auburn obviously every big school in the country is doing this kind of thing and at some point you have to keep up to be attractive; however, I wish universities would focus spending on what is necessary for a great education and not ask students to continue to pay more while they engage in ridiculous building projects. I understand that many buildings are funded by donations and grants not tuition, but I still wish that many could be used in ways that kept tuition down. Should be ‘bouldering caves’ maybe?